A successful, motivating project start is indispensable. That’s why experienced project directors invite their team members at the beginning of the project to a kick-off meeting. A kick-off meeting is a meeting of all relevant project members which also marks the official start of the project or of a new, important project phase. On this occasion, the team members often meet for the very first time in person. This is particularly important in virtual or distributed teams, because the team members might not meet very often during the implementation phase. Usually, the kick-off meeting takes place after the project planning and before the implementation phase begins. A kick-off meeting is not necessarily needed, but successful projects often begin with a get-together that provides an additional boost of motivation for all team members. It is also the best occasion to form a team and to commit the team members to shared goals. Such a start workshop provides a great opportunity to create the project a positive image, to establish an energetic and motivated atmosphere in the team and to prepare the ground for successful project progress. The meeting, however, cannot become a success without proper planning. Our checklist will help you not to miss important aspects and to create a felicitous project start. Look into the responsibilities: Who is supposed to fulfill which function in the project? Determine the meeting participants. Besides the team members and the project director, all relevant stakeholders, external suppliers and consultants and the initiators or the client should be invited. Arrange the place, time and duration of the meeting. Book a conference room of the suitable size with the necessary equipment (check if a LCD projector, notebook, flip chart, whiteboard etc. are available). Optional: Order beverages and catering. Send the agenda and a rough-cut project plan to the participants (at least two days before the meeting). Prepare the handouts for the participants. Appoint a minute taker who will write down the results of the meetig. Optional: Ask the initiators to prepare some introductory words about the importance and the relevance of the project. Use the minutes before the meeting to get to know the participants. Round of introduction: Let each participant introduce himself/herself. Present the project goals: Which results should be achieved? Explain the benefits of the project: What will be better after the project than before? Important note: The kick-off meeting is about preparing the ground for the project and not about details. Comments, criticism, doubts etc. have to be taken seriously and have to be written down. But the meeting is not supposed to aim at a discussion of details of the project plan or of work packages. Explain the rough-cut project plan. Discuss roles, tasks and responsibilities. Discuss the project scope of work: Is the time frame for the project, the project phases and important milestones realistic? Discuss the project plan and dependencies, potential bottle necks and success factors in the project plan – where can possibly emerge problems or risks? Clarify if team members can be released from tasks in the line for the project. Explain that the project plan will from now on be the framework of each status meeting. Try not to go further into the details of the plan. The plan will be adjusted according to the findings of the kick-off meeting. Explain the project management methods that will be used: How should the team members proceed? Stress the importance of each individual in the team: Everyone has to deliver reliable results and give feedback about his or her work packages. The success of the project also depends on the team spirit. It is essential that the team members support each other if problems occur. 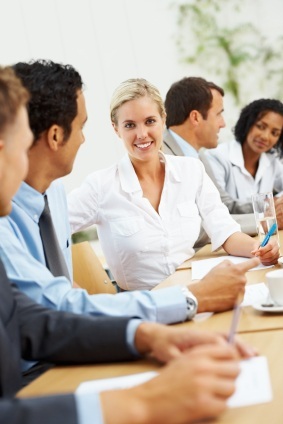 Participating in the status meetings is as important as giving feedback on a regular basis. Status meetings: How often will they take place? Who will participate? Can there be telephone conferences? The kick-off meeting is a good opportunity to make the first appointments. Update of the project plan: How often will the plan be updated? Who is allowed to make an update? Who has the right to delay important milestones or deadlines? What will the reporting structures look like? Who will report to the management? Which communication channels are supposed to be used? – Telephone conferences, Skype, regular conferences, project management software… etc. Which project documents are to be created? How will the document management be organized? Important: You cannot stress enough the importance of providing important project information to the whole team. This is the time to find out about the atmosphere in the team. Please leave enough room for questions, doubts and comments in the agenda. Collect the questions, ideas and proposals and use them at the appropriate time and place. Adjust the project plan according to the findings of the kick-off meeting and send it again to the participants. Check list: Kick-Off Meeting - InLoox • Copyright 1999-2019 © InLoox, Inc. All rights reserved.